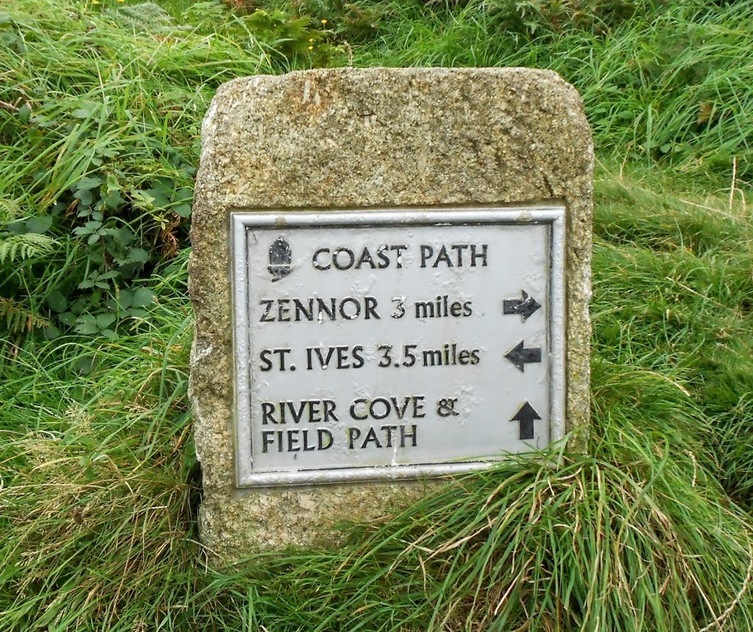 We were a bit intimidated reading the guidebook, which described the walk from St Ives to Zennor as "...one of the toughest sections of the whole trail." Were we making a mistake doing this section as our first Coast Path hike because truthfully, we weren't sure if we were prepared, not having done much hiking for the past the six months. But off we set, both of us in sneakers (or trainers as they're called here), even though my sister had strongly suggested hiking boots and she would turn out to be right and I should have listened. 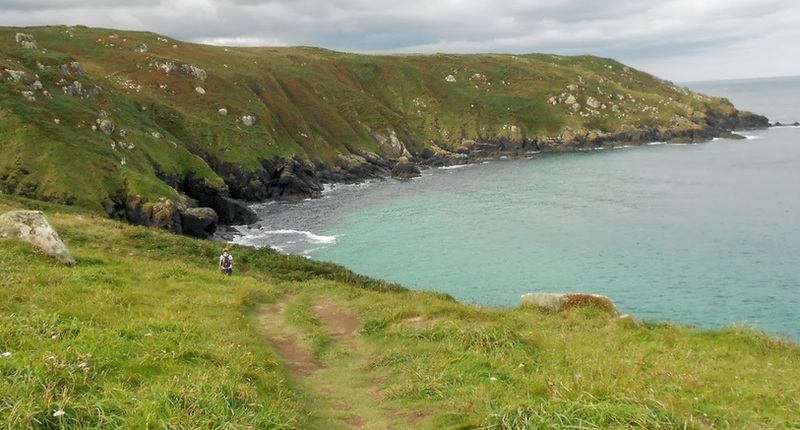 The path hugs the coastline, zigzagging up and down rocky cliffs, cutting across fields and splashing through boggy patches. It's like poetry. See that woman up ahead? She will turn out to be someone we hike the path with year after year after year: we'll meet her family, stay in her home, and share various self-catering places all over the south west. But in this picture, at the very beginning of the trail, we don't know her, though when we come to a fork in the path, we choose to follow her rather than a big hiking group with maps and walking sticks because she appears to know where she's going. To our left is a checker board of bright green fields, one of my favorite views in all the world. But there's history behind those hedges. Many historians claim that the Acts of Parliament—which allowed the boundaries to be created—impoverished small farmers and destroyed the way of life that had supported villagers for centuries. To understand why, you need to know about land usage way back when. For centuries it was universally understood that the poorest villagers could have access to certain common lands (land privately owned but to which others had legal access). It worked like this: after the landowner had the harvest brought in, struggling families were permitted to glean* whatever grain was left on the ground, and then let their livestock graze the field—eating their fill while depositing manure for the next crop. It worked well for both sides; until it didn't. As modern farming innovations started crawling across the fields, it became increasingly profitable for landowners to work larger and larger plots of land. So, landowners fought for Acts of Parliament that allowed them to enclose their land—essentially taking away the only means of sustenance for the country's poorest people. Between 1604 and 1914, Parliament enacted more than 5,000 Enclosure Bills, resulting in the enclosure of some 6.5 million acres. The hungry villagers had no choice but to seek lodging and work in the already crowned cities; they didn't often find either. ​Well that sure was a bummer of a story. *Women gleaning. Must be hard on the back. 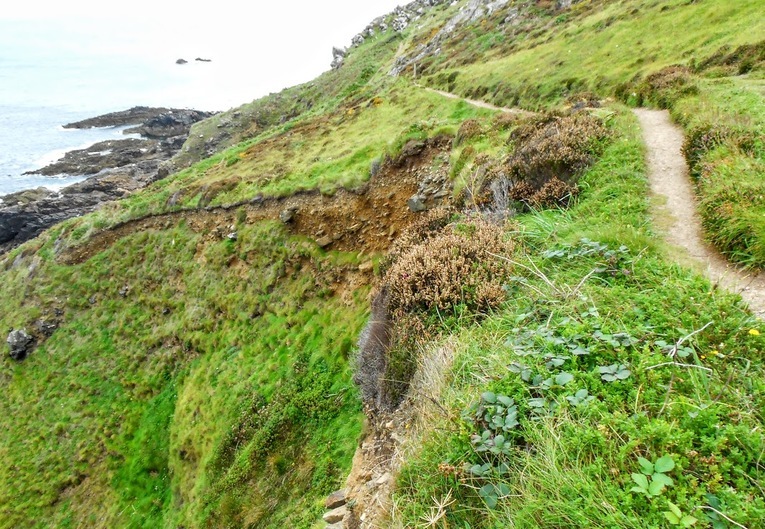 Erosion: With the sea beating incessantly at the cliffs and storms battering and loosening soil, plants, and rocks, the path slips over the edge sometimes, barreling down to the sea in a spectacular display of the forces of nature. Best stay away from the edge. The halfway mark, where we sit and drink our tea, wishing we had packed cookies (biscuits in the UK). Some of us wander inland to pee. I'm not saying who. We finish the walk with a stop at the Tinners Arms. 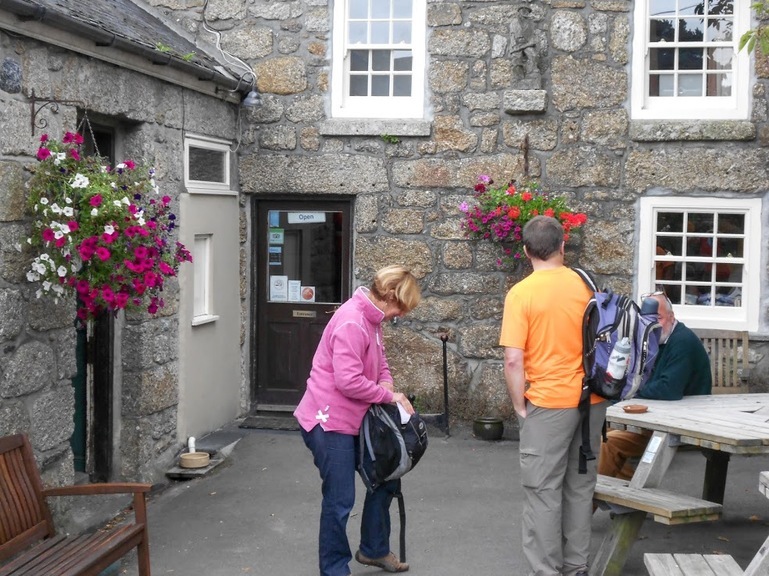 We choose this place because it was built in 1271 and how often do you get to go inside such an ancient building, and also because it's the only pub in Zennor. Inside it's warm and cozy, with an open fire, low ceilings, and stone floor worn smooth from centuries of feet. By this time we know Susanne well enough to know we travel well together. ​Plus she's a native and therefore privy to all kinds of stuff mere tourists wouldn't know. Luckily Susanne is staying in St Ives too, and actually has a bus schedule with her, so we didn't have to stand at the bus stop in the rain praying a bus would come along, which I guess is what Bob and I would have done, because stupidly, we hadn't thought to secure a bus schedule. Susanne even knows which side of the street to stand on which helps tremendously, everything about driving in the UK being backward and all, causing us to look the wrong direction for oncoming traffic Every. Single. Time. 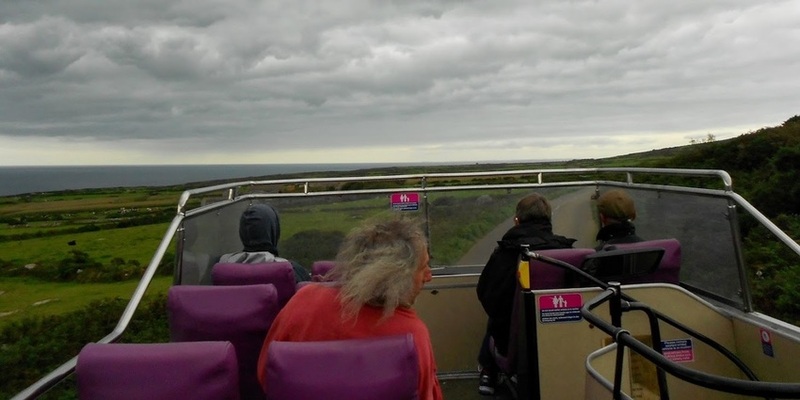 It's windy and spitting drops of rain but we brave the elements and ride on the top of the bus, because of course. 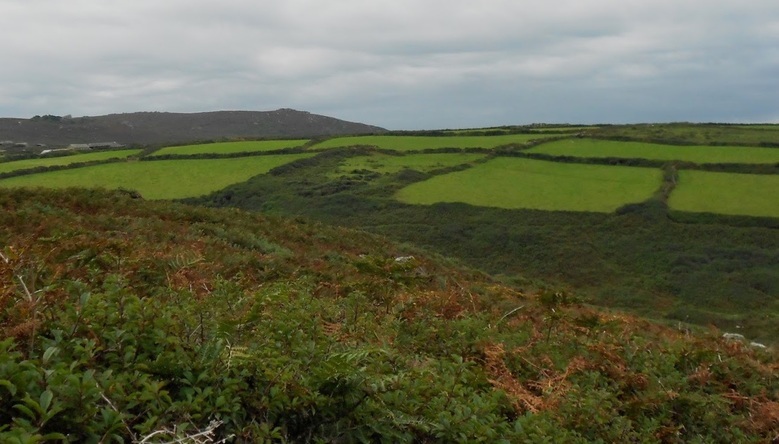 This walk is our gateway drug to the South West Coast Path; we are hooked.